You knew this was coming, right? I mean you all expected this! 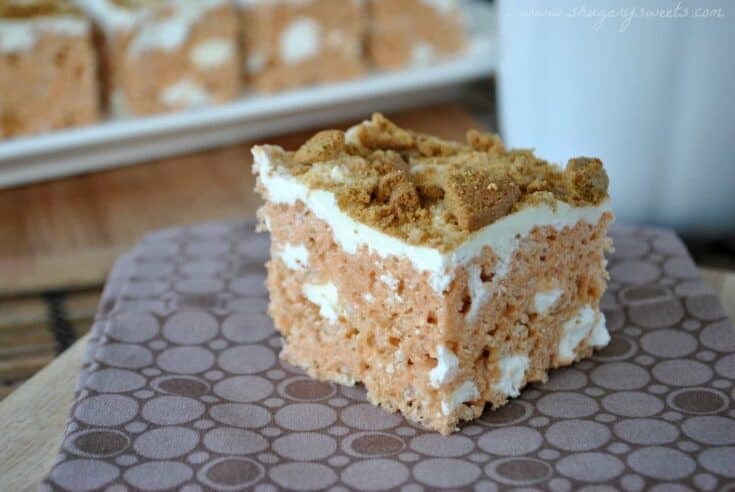 Gingerbread Krispie Treats. Made with the new, seasonal JELL-O Gingerbread pudding mix. For a fun twist, I threw in some white chocolate chips and mini marshmallows. Oh, and then I topped it with some melted white chocolate and crushed Gingersnap cookies. This might be one of my favorite varieties yet. No kidding!! Needless to say, when it comes to Rice Krispie Treats I seriously have zero willpower. And perfecting how to make rice krispie treats is my superpower. I have been known to eat an entire batch before anyone is home from school and work. Just cutting small slices throughout the day (okay. Large slices). But these? I ate ONLY 5 and packaged the rest of them up for my husband to take to work. 5 giant Krispie Treats. Now that’s willpower, hehe!! Prepare a 9inch square pan by lining it with foil and rubbing butter over the foil. Set aside. In large saucepan, melt butter. Add bag of mini marshmallows and stir constantly on low heat, until melted. Fold in pudding mix until combined, remove from heat. Add in cereal. Fold in 1 1/2 cup mini marshmallows and 1 cup white chocolate morsels. Press into prepared pan. Melt remaining one cup of chocolate morsels. Spread over krispie treats and sprinkle immediately with crushed cookies. Allow to set (about 2 hours). Cut into squares and store in an air tight container. ENJOY! I have no will power when it comes to rice krispie treats too! All the little slices throughout the day…oops, there goes the pan:-) LOL I knew these were coming and I still forgot about it. They look great. I love the extras on top!!! So glad I can surprise even you!!! Oh my I have been eying that pumpkin instant pudding and now I really need to get some. Capital-L-OOOOOOVE these, Aimee! Gingerbread is one of my fave holiday flavors 🙂 these treats look so yummy in my tummy! When it comes to Rice Krispie Treats I seriously have zero willpower too! Girl – I LOVE THEM! No matter how old I am, Im always like a kid around them 🙂 And gingerbread – soooo good! Great job on these! Mmmm! I am a BIG sucker for gingerbread! I’ve been trying to come up with a fantastic dessert idea to take to a pot luck we do often with friends. Something not messy but also would make the kids and adults want a bite. These are the ticket! Thank you so much for sharing! I think I might need to make the banana Krispies too! Good Golly! 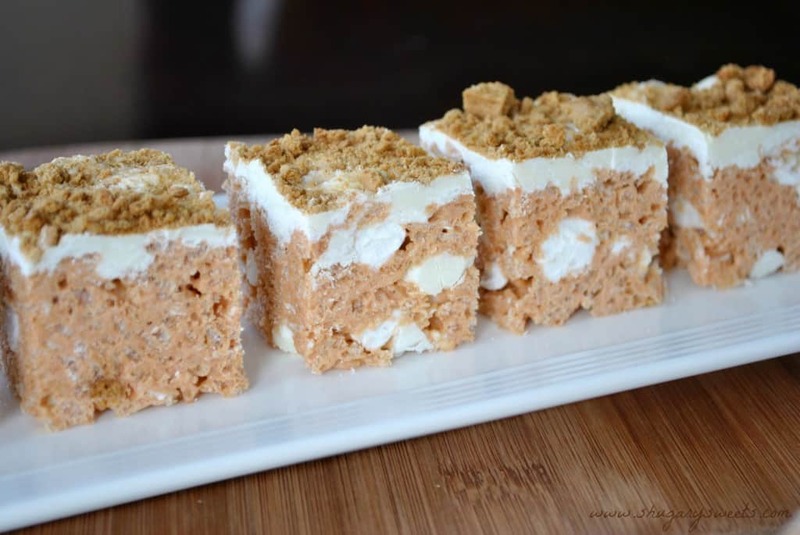 Love this twist on Rice Krispie treats! Good lawd! These look amazing. I love how creative you are. I guess I need to add another recipe onto my “must make” list. Thanks Aimee!! I love gingerbread and I don’t think I add it to enough things. I will have to get looking for that pudding! 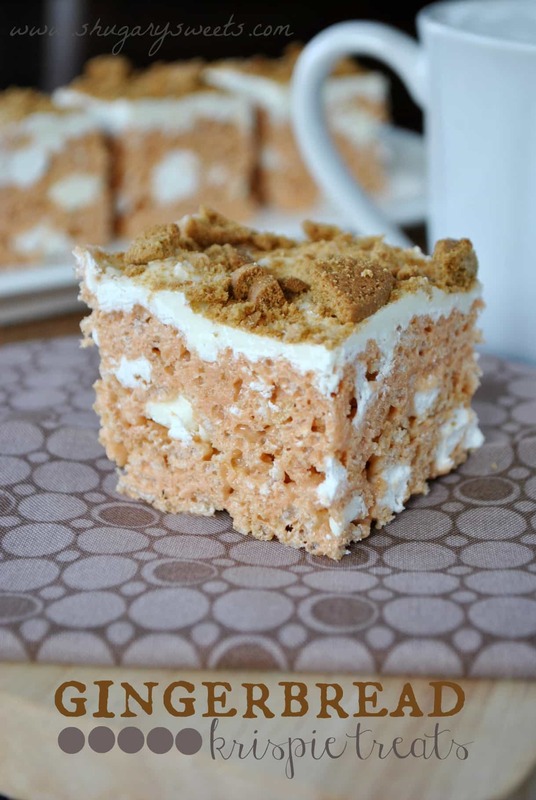 If you had to have a weakness, there are much worse things than rice krispie treats! I love the look of those mini marshamallows in the mix! Oh my kids are going to be all over this one! Rice krispie treats are my weakness, no doubt. You are a better person then me though. I would have eaten the whole pan and then blamed it on the dog. These look amazing! Love them!! Yum!! I need to make something with Gingerbread flavor for a group I am a part of, I am totally try these! Mmmm! They sound so yummy! Thanks for sharing at Show & Share, featuring this tomorrow! Guess I am the only one who tried this wonderful recipe. Whempn I put the instant pudding mix in the mixture and the rice Krispies become a huge glob and was hard to put onto a pan and the was almost difficult to ut. What did I do wrong…I made it twice. Tasted good just to difficult and to thick to manage. Sorry. I’m not sure what might have happened?! 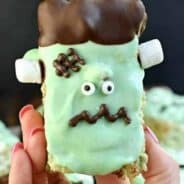 I make krispie treats with pudding all the time! Did you mix in the pudding mix real good before adding the cereal? I’m at a loss here…as I’m not sure what could have been different! Sorry!! I had the same problem. I think maybe the heat needs to be raised a smidge to keep the mix pliable or kept over the low heat while mixing. Other than that, they turned out fine. My husband said they were too sweet, I liked the flavor, but would use less white morsels, or not use them in the mix, just on top. I was really surprised that my husband said they were too sweet as he has a sweet tooth the size of a skyscraper! The gingerbread pudding imparted a nice flavor. Thanks for the feedback Barbara! They are definitely sweet!!! Aimee -A thought occurred to me that the difference could possibly be the stove – gas vs electric – direct flame vs heated element? I find that using my electric stove on low is “too low” sometimes and bump it up a notch when melting, etc. What type of stove do you use? ditto here Michele 🙁 very hard to find the fancy pudding here, now that i am addicted! I see you can get a four pack on amazon for $13.44, ouch! Hi Elizabeth, I see on ebay there is a case (24!) for sale. cost ends up being about $1.50/box. we should get a few people together and buy and split it! I can’t seem to find the gingerbread jello mix. Is there anything else I can use to substitute it with? It’s such a unique flavor, it would be hard to substitute. But you can use the same concept with any flavor of JELL-O pudding mix. Or add in some chopped up Gingerbread Oreo cookies to help give it some gingerbread flavor! I think next year I need to have a big giveaway with all the seasonal flavors of Oreos and pudding mix!!! 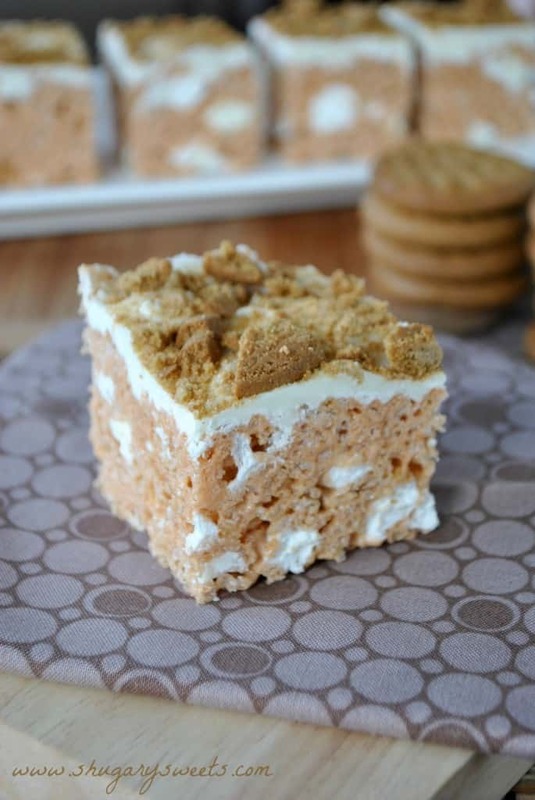 I think I might try the butterscotch as a substitute-maybe half a box ? I actually looked online and they carry it at KMart. I almost didn’t find it. until I asked someone. I gave them a big hug, when she showed me the display. They were on sale for 69 cents, so I bought several boxes! Thank you! I’m making these, this weekend. Yeah!!! So glad you found them!!! Yikes! I’m making these this evening and couldn’t find that crazy pudding anywhere! :o( Think I can pull it off with vanilla pudding and extra ginger? Hmmm, definitely the vanilla pudding…not too sure about just ginger. Maybe add some cinnamon and cloves too (with ginger). And molasses…. for those who cant find the pudding mix, i bought a packet of dunan hines frosting creations flavor mix (its a small .10 oz packet you mix in vanilla frosting to give it a kick) i used it in place of the jello and mine came out great! it gives it a really dark colouring though, because its ginger! but it tastes delicious. I looked at 6 different places for the pudding mix and while i couldn’t find that anywhere i found the frosting mix at 4 of the 6 places next to the cake frosting. Good to know thanks Shey!!! 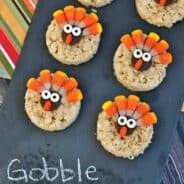 Hi I’d love to make these and was planning to make them today for an Xmas dinner! But I cannot find the jello gingerbread pudding mix! Where can I buy it? I gave up last year trying to find the pudding in stores. BUT, there are people selling it on ebay! You can find it there for sure. Good luck! 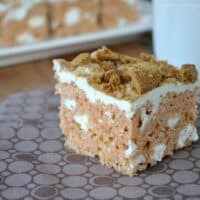 I would love to make any of these delious looking ricekrispie squares for xmas,, but can anyone tell me if these can be frozen, or will they be soggy after,, even the ones made with the pumpkin pudding??? Please let me know,, would like to add to my list of xmas baking. 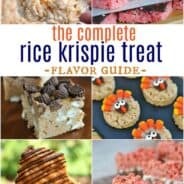 I don’t think rice krispie treats would be good once frozen. They would definitely lose their delicious chewy texture!